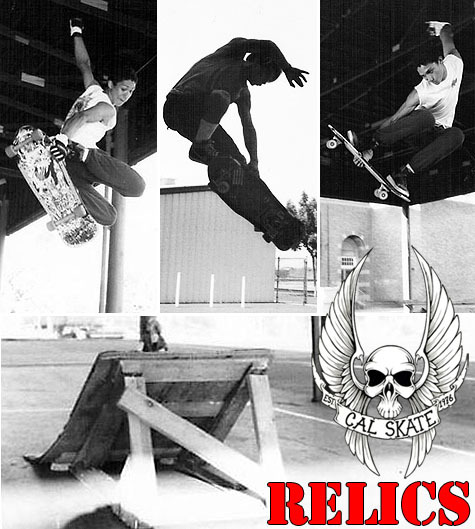 Spinning the retro vibe for your launch ramp edification, you’re tuned into Cal Skate Relics. Help us identify this week’s skaters along with any self-incriminating stories. Check out all the sinew busting action after the turn. I think his name is Adam Musenkant (sp?). Him and Sarge were the best in Ptown back in the day in my opinion. I think the dude with the gloves is Tyrone? Any Cal Skate Relic photos of the contests at the waterfront stage? Anyone remember chasing the skinhead who bashed the windows out of the car obstacle? Or the dude who jumped into the river in the middle of his run? I’ll have to run these names by Paul…He couldn’t remember any of these cats names! Oh, yes! we have plenty of the waterfront contest photos as well. Maybe we’ll do some of those next week! #2 – The mayors son, Nick Clark. #3 – Jeff Montiejo, Rebel Skates teamrider and former Cal Skate employee. #6 thru 11 – Tyrone Talbert, Rebel Skates teamrider and Alva flowrider. The Sarge was definitely the best mid 80s PTown skater but Tyrone was close on his heels. First guy I ever saw ollie over a picnic table. #12 – Adam Musekant – Cal Skate teamrider. #1, 4 , 5 – The names escape me but they were locals at Rebel. Looking forward to the Waterfront Park contest pics. Lots of epic skating and one of the gnarliest bonebreaks that I’ve ever seen on the main jump ramp. Had Howard Weiner (on the mic) and 500+ people speechless and gasping for composure. I remember my brother telling me about Tyrone: “He can ollie onto a picnic table.” The feat was superhuman, unbelievable. The story, nay the myth, nay the legend stuck in my head. And now here we are twenty (?) years later with a confirmation. So rad. Give me a break Junior. I’m buddies with Nick and Tyrone and i know who Adam Muzikant is for christ’s sake. Now that guy is a scientific PhD. on the east coast I believe. Adam was definitely like an old school Pro, but Tyrone was truly one of the greatest. Once I saw him frontside ollie to tail on the cement garbage cans at Grant HS circa 87. Don’t tell me I can’t remember, you guys thought Tyrone was Tommy Guerrero – LOL. Nick is still out there shredding. We owe everything to that guy, first Portland skater with heavy government connections. Mega PROPS to Reese for busting out with the info. I was just a little kid when these pictures were taken. Is that chapman schoolyard? I do remember seeing a few skate jams back in the day there, with the old caddilac fins in action. seems it was rebel turf then ,but what do i know, i was just a kid then .great memories. The dude in exhibit #3 in this post is also the dude in this prior Cal Skate Relic post (see exhibits 1, 2, 3, 10, 11 and 12) identified as Cab. The guy sure has Cab-like style and is sporting Cab period appropriate attire. So is that Jeff Montiejo as well? And the jury says……? I’m claiming Montiejo. He had LA roots so he definitely was into the whole mid 80s Cali /Venice Beach thing when it was hyped—But I’m certainly willing to admit that 25 years can compromise a memory. #1 – Craig Strayer. Rebel local–from Beaverton if memory serves. #4 &5 – Can’t believe I missed this but both shots are of me. It was a seriously weird period of my life where I was in and out of a treatment center and halfway house. I cut my hair trying to look good for the judge. As I’m on lockdown, I’m riding on a borrowed board.This was at a small schoolyard in NE Portland, the name escapes me. dude, exhibit 3 is CAB! check the first and second relics posts…you can match up the nikes the stickers on the board, and the track in the background! This is some good stuff. It’s Irvington Grade School under the covered basketball courts. Tyrone had the best Ollie skill in Portland, period. And billy had the most shredding style, vert and street. Good times were had by all.